Comics Cube! Reviews: Whatever Happened to the Man of Tomorrow? So, to absolutely no one's surprise, I stopped by at Planet X Comics this week and bought stuff. And one of the things I bought, funnily enough, was something I already have: a collection of Alan Moore's Superman stories (not counting Supreme, for rather obvious reasons). The collection was the recently released trade paperback version of Whatever Happened to the Man of Tomorrow? and one of the selling points was Brian Bolland's artwork (always an eye-catcher at any comics store) on the cover. Bolland is one of my absolute all-time favorite cover artists, and if I were the type to buy a comic for a cover alone, my shelf would be full of Brian Bolland stuff. And one of the best things about this is that it's a great remake of the original Action Comics #583 cover by Curt Swan and Murphy Anderson. but it's the same as the TPB edition, and I didn't feel like scanning. The other reason it was nice to buy this one is the difference in the opening page of the titular story. See, when I bought the original collection (published in 1997) in 2002, this is what the first page looked like. The text went on the left side. 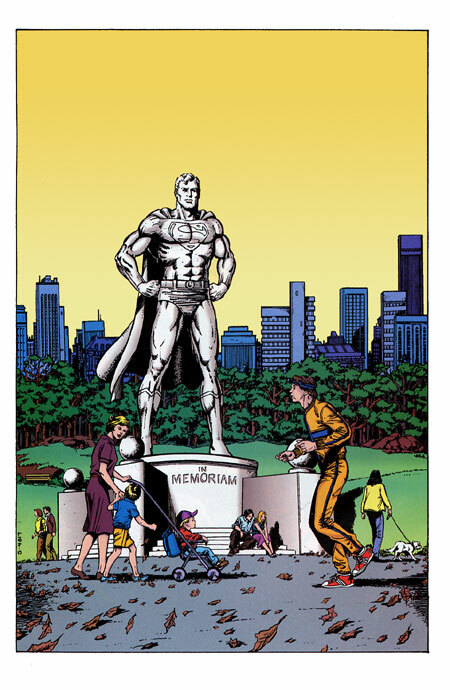 I always thought it was damn odd how they just had that big yellow blank spot on top of that page of the Superman statue. Later on, I found out what the front page was actually supposed to look like, and I was just completely mesmerized. As beautiful as the text was, the way Todd Klein lettered it heightened its impact. For the life of me, I can't at all figure out why removing it and setting it in italicized TIMES NEW ROMAN type on the other page ever sounded like a good idea to anyone. Seriously, isn't this much better? Whatever Happened to the Man of Tomorrow? is such a beautiful, touching story on so many levels. 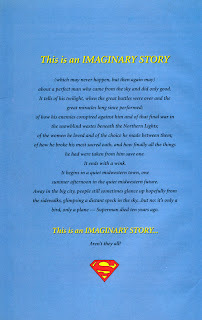 It functions as the last Superman story - as in the final story in the saga of the Man of Steel. 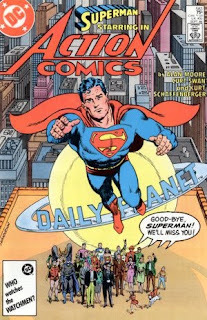 And for the saga of the Silver and Bronze Age pre-Crisis on Infinite Earths Superman, It tells of his final days and of his final battles, and of how his oldest enemies came back one by one to kill him. 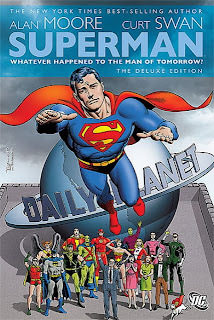 It is a great and grand celebration of that time's Superman, and incorporates all of his important elements - including making a heartbreaking decision between Lois Lane and Lana Lang, the destruction of the Fortress of Solitude, the death of his oldest and dearest friends, and even the tearjerking deaths of some of his deadliest villains. The scene where Bizarro dies remains as poignant and powerful as when I read it eight years ago. The artwork, as penciled by legendary Superman artist Curt Swan, and inked by George Perez and Kurt Schaffenberger, is spectacular, detailed, fantastic, and full of wonder. For those who know Moore only through Watchmen or V For Vendetta, and only know him for his elaborate prose and formalist transition techniques (like the one where he has the image in one panel reflect the image in the next panel in a different scene), you might be surprised - this story is as straightforward as it gets when it comes to storytelling techniques, truly in the spirit of the classic Binder/Weisinger-era Superman. The prose is still there, but it's not everywhere. The opening text, of course, at this point, has become legendary. And, might I add, it's perfect. It captures everything good about Superman, the fairy tale, fantasy aspect of his, and I think "a perfect man who came from the sky and did only good" is the best way to describe him. Throughout the story, there are also these wonderful (and I say that in the purest way possible) descriptions of Superman and his powers, his capabilities, his surroundings, and the impression he has on people. One of my favorite touches is when Lois Lane describes him as a violet comet, because when he flew, the reds and blues mixed together. 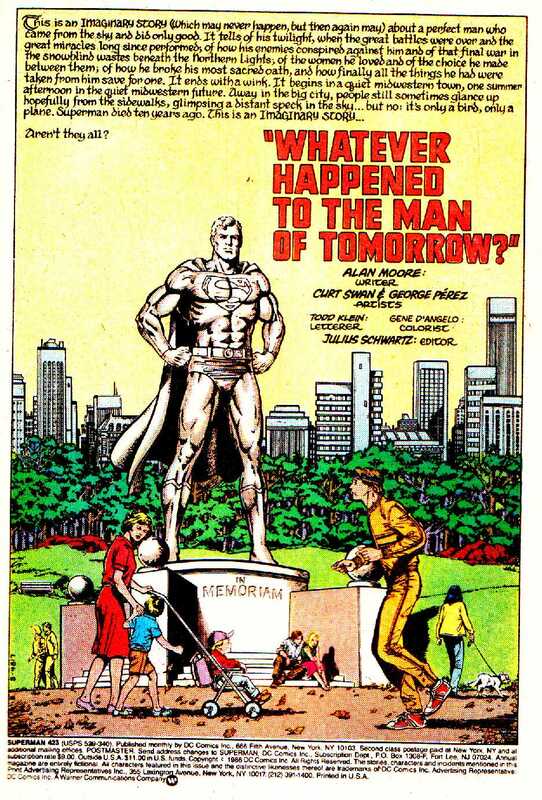 The ending of Whatever Happened to the Man of Tomorrow? is predictable, and you see it coming from a million miles away, but in a good way. The story is written in such a way that if you don't get that ending, you'd be too disillusioned. And another of the best things about the story is its simplicity. No one's going to bother overly explaining why Captain Marvel shows up, or why Lana Lang gets powers from some magical bath - it just happens, and you take it for what it is, because that's the way they did it in the Silver Age, and there are more important things going on in the story than figuring out who got where and why someone showed up when he wasn't supposed to. Whatever Happened to the Man of Tomorrow? ranks among my all-time favorite Superman stories, and in this new edition, it reads as freshly as it did when I first read it in 2002. I so highly recommend it, even if just for the scene where Bizarro says hello to Superman. The next story in the collection is "The Jungle Line," by Alan Moore and Rick Veitch, which was first shown in DC Comics Presents #85 and reprinted in the Alan Moore DC Compilations. 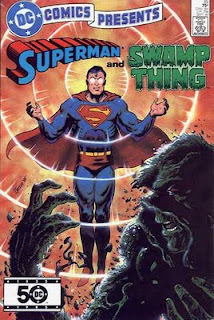 It features a meeting and a team-up between Superman and Swamp Thing that is really neither a meeting nor a team-up. it to anyone who wants it. Prices negotiable. When I first read this, I was a little disappointed. 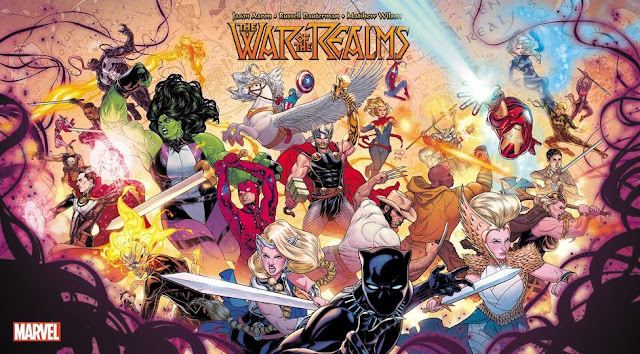 I was expecting something mind-blowing, since I was in the middle of reading Moore's run on Swamp Thing at the time, and therefore this felt like a big event. It wasn't; it was just a regular issue of DC Comics Presents that was just well-written and well-drawn. Essentially, Superman contracts a rare Kryptonian disease that has no cure, and he travels to Louisiana to die, where Swamp Thing helps him out. 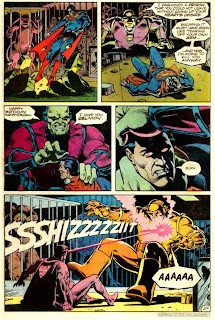 Beyond being a small meditation on the nature of life and death (as seen through the eyes of Superman), the story is full of the type of prose Moore was using at the time in Swamp Thing (i.e., ornate and nice) and is a good showcase of what Superman and Swamp Thing are capable of. Other than that, it's really too simple and really doesn't go beyond being a well-done Superman/Swamp Thing story. Which is fine. I don't think it was ever supposed to be more than that. Disappointment in it is just reflective of Moore's status as a writer now affecting whatever else he did then. 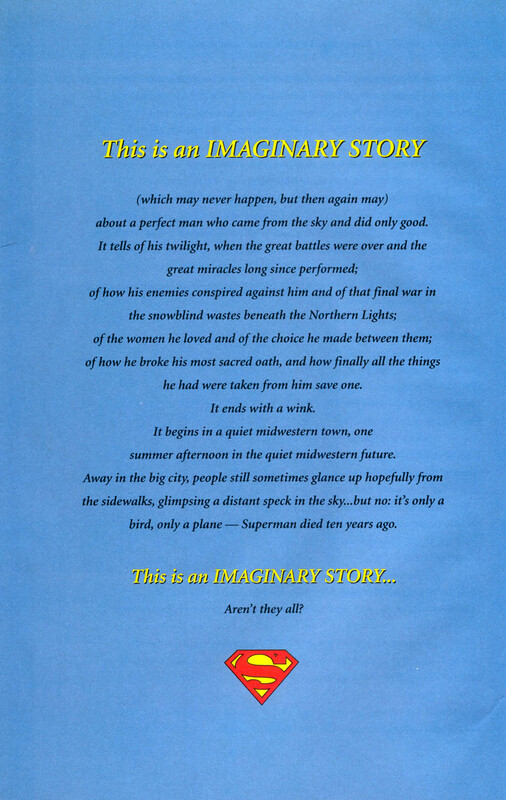 The final story is "For The Man Who Has Everything," by Alan Moore and Dave Gibbons, from Superman Annual #11. That's right, folks, the final story is by the Watchmen team, and you know what? You can tell. Not only is this the best I've ever seen Gibbons' art (I think I even like it better than his art on Watchmen, though that may change depending on my mood), with its technical fluidity and smooth lines. It also incorporates some of the techniques that Watchmen made famous, especially as it pertains to transitions, like I mentioned earlier. In fact, in an interview, Moore said this story functioned as a dry run for Watchmen. "For the Man Who Has Everything" takes place on Superman's birthday. When Wonder Woman, Batman, and Robin come to give him his presents, they find that he has a plant called a Black Mercy on his chest, planted there by the intergalactic warlord, Mongul. The Black Mercy creates an illusion in the victim's mind that he has gotten his heart's desire - in Superman's case, a world where Krypton never exploded. 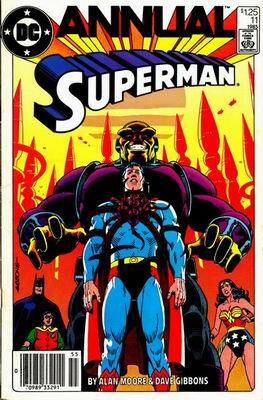 So half the issue takes place in Superman's mind, where he's married to Lyla Lerrol (points if you get the reference, has kids, and is an archaeologist, but is at odds with his father Jor-El, who is now a political doomsayer, and the other half takes place in the real world, where Wonder Woman fights Mongul while Batman and Robin try freeing Superman. I have some major issues with this story's premise, in that it's clearly flawed. Superman's true desire is to have none of the friends that have surrounded him for his whole life? It has nothing to do with the Kents, the parents who actually raised him? No Lois? No Lana? What's more, his heart's desire is such that he's at odds with Jor-El? I find it difficult to believe, and in fact, when Bruce Timm and company decided to adapt the story later on in Justice League Unlimited (which you can view here), I think they concluded the same thing, because while Superman's world still didn't explode in their version, he was married to a mix of Lois and Lana ("Loana"), and he was at peace with Jor-El. The point of Moore's original story is a statement against the people who continually wish - those who say "If I'd only done this, maybe things would be different" - by saying that if you did get what you wish for, you'd be making things worse. Essentially, it's to stop seeing your what-ifs and elseworlds and alterniverses through rose-colored petals. Which I get, and it's a good message, but the premise of the story, with the words "heart's desire" is certainly misleading. Another issue I have with the story is the way it ends. Don't get me wrong, I love Alan Moore, and his work always blows me away, but I think sometimes he just doesn't get the whole point of an adrenaline rush - the sheer joy of seeing a good guy beat up a bad guy because it's awesome. For example, in Miracleman, Miracleman never ends up winning because of something he does himself. Something else always wins it for him. It's the same thing in his Supreme run, and it's also the same thing here, where the day is saved by, quite frankly, the lamest character who can possibly do the saving. I know that when it comes down to the big point of the story and the message and overall storytelling technique, it's a nitpick, but it's that nitpick that prevents this story from being completely awesome. Having said that, this story is full of great art and writing. As I've said, I've never seen Dave Gibbons draw better before or since, and this is the story in this collection that is most like Watchmen, right down to the prose. 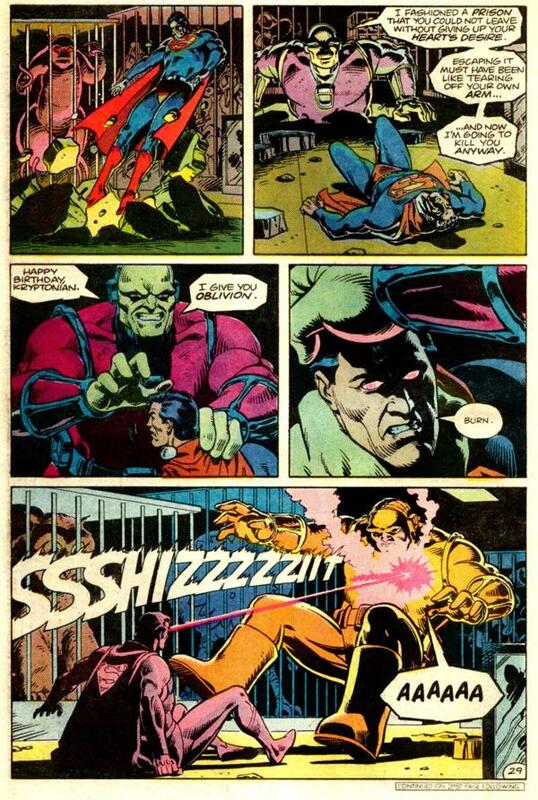 Of a panel where Superman trades punches with Mongul and uses his heat vision, the caption reads, "Eyes spit out suns, muscles shift like continental plates, rolling under a hide of jaundiced leather." All very apt, and it makes the captions a treat in themselves, adding to the tension and reading experience rather than taking away from it. This is also the most, if I may, badass Superman story I've ever read - and I've read a lot. From when Superman breaks free and yells out "Mongul" to the point where he tells Mongul to burn, if you think Superman is too much of a goody-two-shoes, this story is the one you need to read to shatter your illusions (which makes the prior nitpick even more valid, unfortunately). So "For the Man Who Has Everything" is not a perfect story, but it's still pretty damn good. And it's a nice way to end the collection. If you've never read these stories, especially the lead, this collection comes highly recommended. If you have read them, bear in mind that this edition has some minor recoloring, and viewing things with fresh eyes sometimes makes them fresh again. 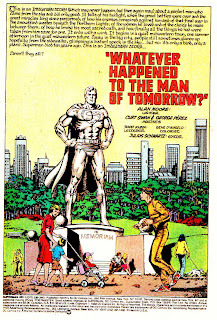 I know that reading Whatever Happened to the Man of Tomorrow? was like I was reading it for the first time all over again. It's still as good and as moving as I remember.